The online documentation for this is a complete mess. If you click on the link to download the software for this model printer, it actually takes you to a webpage describing how to search for your driver software on the Brother site. I have quite a bog standard Netgear WNDR wireless N router which occasionally behaves like a total pile of piss, kicking off various devices and generally being terrible. This has caused my printer to lose its connection and never regain it in the past, which is why I've had to go through this pain so often. It helps sometimes to merely restart the router and the printer. This should be attempted before trying to install the drivers, as those require booting into windows and moving the printer. First, you want to ensure the drivers are not installed. If they are, the setup software will eventually error with a message like "AN error has occord" (SIC). I'm not sure if this is strictly necessary, but it was easier for me to also not have the printer plugged into the USB before starting the setup process. Finally, if you are really going to re-setup the wifi, you should hit menu -> 4. Network -> 0. Network Reset, which will clear the previous config and restart the printer. Download the Brother HL2280DW Drivers. Only windows can send the data to the printer. This unzips two folders; one called wlan_wiz and another install. Inside install/HL-2280DW/ there is a program called Setup.exe, which you must run. From here, click next/confirm/etc until you get to a page in the wizard with 3 choices: USB, Wired, or Wireless Setup. 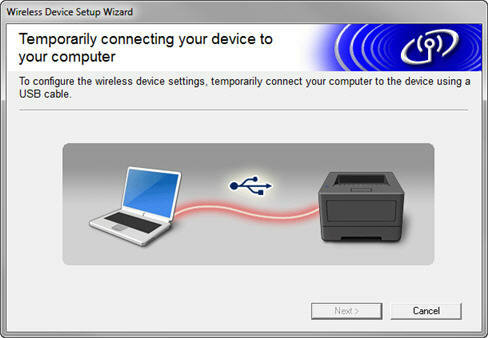 Although we are setting up wireless via USB, you must choose Wireless Setup. If you plug in your printer now, it should actually install the USB drivers and continue from here. If you ran wlan_wiz, it would never proceed. From here, the Setup will scan for your wireless network. In my experience this has worked; it will use whatever network your computer is connected to. If you did not uninstall the drivers first, here is where the error will "occord".